CNH Media specializes in Online Marketing. They improve their customer visibility with, amongst other things, Google Adwords and SEO optimizations. One of their most popular service is to improve web advertisements for their customers. Therefore, when reaching out to potential leads, they need to gather a large array of information about the current search results of the customer: Areas for improvements, targeted keywords, categories ... all should be accessible with a quick glance! In a normal situation, this would require them to store this in a screenshot or text document, which they store it in a shared folder or in an external platform. Then, they would open it everytime they contact a lead. Of course, additional fields can be created, or users can fill in a Note, but that data wouldn't be centralized in a convenient area. Instead, it would be drowned or buried deep in the CRM. Like all marketing agencies, the life at CNH Media is face-paced and every second counts. So, they need to navigate in a customer profile with the most accuracy and productivity! At CNH, the sales team use HubSpot as a main tool to manage customer data. Therefore, all needed information should be easily accessible and centralized in HubSpot’s interface. Entrusting our HubSpot consultancy experience and integration experts, CNH Media has reached out to Elixir Solutions to develop a tool that would enhance their HubSpot experience! 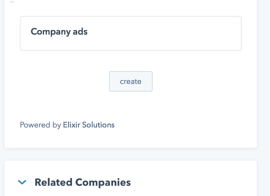 The “Elixir” Solution: HubSpot CRM extensions! 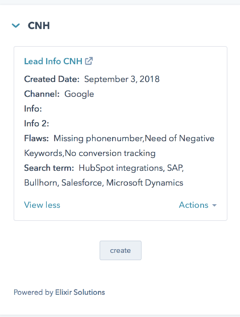 Using our deep knowledge aligning HubSpot with other systems, we collaborated to offer a tool that leverages the latest HubSpot technologies and is tailored to CNH's needs. Thanks to HubSpot’s advanced app authentication, no further login is needed. Without needing access to an external platform, all required customer data is displayed right within HubSpot and can be edited immediately. And this was created within a single click on the company profile! Extend your own HubSpot interface! Whether you need a similar screen, or if you would love to display in HubSpot additional information from external systems within a few clicks: contact us! 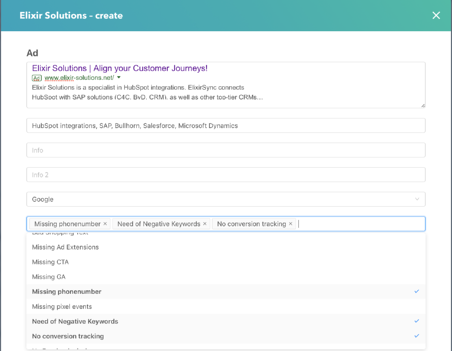 Let’s assess together how, by leveraging HubSpot possibilities, you can improve your customer journey alignment. CNH Media (https://www.cnh-media.com) helps companies daily promote their business's online visibility to their customers. As a customer at CNH Media, you will find that you are part of the entire process - from the conclusion of the collaboration to launch the finished product. They are in dialogue with you all the way. This ensures that both parties are tailored to suit every need. CNH Media often often experience returning customers, and we value and live long-term relationships with our customers. They hold your hand throughout the process so if you have any questions, do not hesitate to contact hem!